Okay, Okay. Being bad is obviously not a great attribute. The thing is women who take a trot on the bad side really make life more interesting. Ladies are taught to be soft-spoken and polite from the time they toddle. So when they break the rules, it's more exciting than the run-of-the-mill villain we're all used to. No one would still be talking about Lizzie Borden if she hadn't been so dainty and well behaved besides the carnage she was associated with. Then there was that Hungarian countess who bathed in blood. Yes, not a good person but her skin tone was so very even! And that is why it's so important that lady villains dress to the nines. After all, when you're going hire a woodsman to hunt down your local princess you don't want to seem like you're phoning it in. This dress is a dashing look. It has a gentle v-neck and is attached to a high white collar. It's attached to a heavily pleated cape with a red-trimmed interior. The black dress has an interior purple panel with a black overlay. 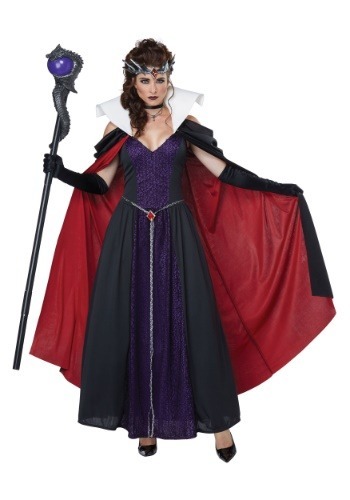 The skirt is full and ankle length, giving you a dramatic entrance whenever you want to announce your evil presence. It's about time the princesses in your vicinity get put in their place. What do they think they can just sing to birds for the rest of their life? People will know you mean business when they see the tall collar and dignified cape you're rocking. Want to top this costume off? Bring a staff and bright red apple along. Just don't expect people to accept any treats you offer. You might be royal but you don't have a great reputation!